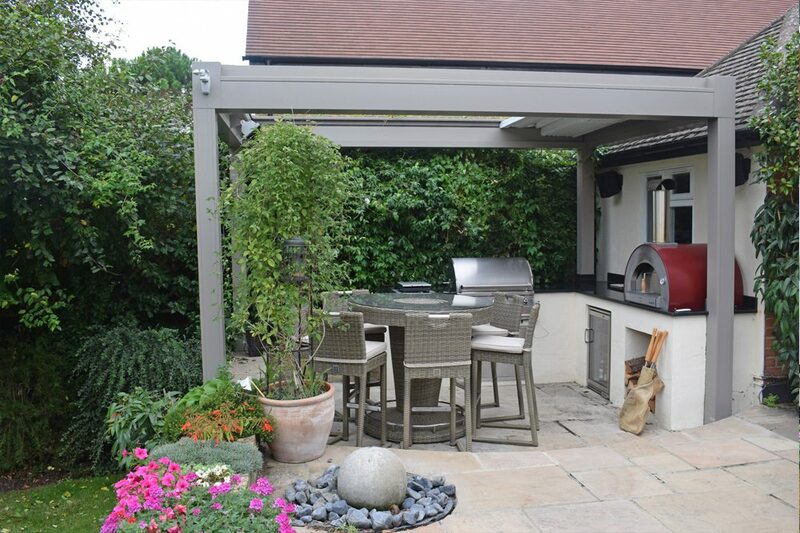 A covered outdoor kitchen, planned and built on a perfect timescale for summer BBQs. This outdoor kitchen enhances the well-used terrace by including a sophisticated cooking area with a Mediterranean feel. 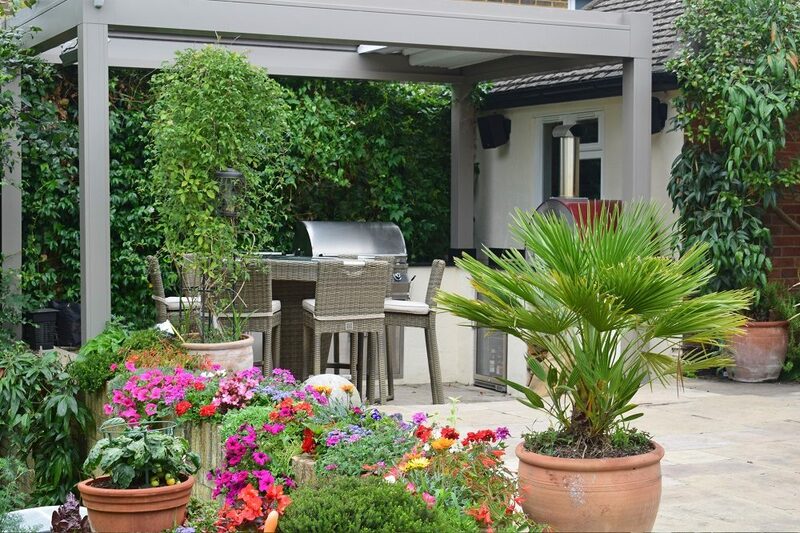 This client regularly uses his large tiered terrace overlooking a well-established garden for socialising and alfresco dining. The client wanted to create a defined cooking area with social, informal seating, across from a formal seating area on the other side of the garden. 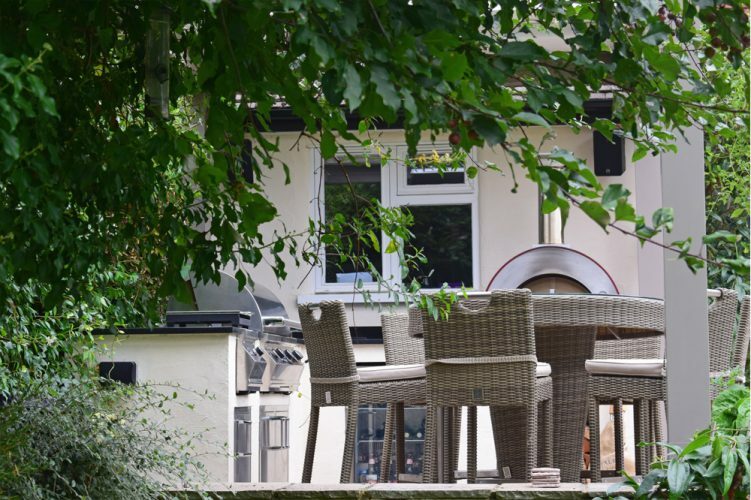 The client approached us in January with a clearly defined timescale in mind to complete his outdoor kitchen in time for spring. This 3 month period was the ideal span to take the project from design through to completion. 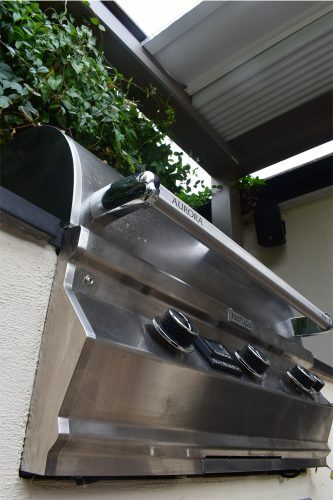 The client had a specific area to accommodate the Outdoor Kitchen, which he hoped to include a gas BBQ Grill, a Side Burner, Outdoor Fridge and a Ceramic Grill. The available space was a rectangle covering 10m², set slightly lower than the remaining terrace. The space is adjacent to the house on one side and has a low wall with 1m drop to the main garden on the other. This area lent itself nicely to an L shaped outdoor kitchen design, providing adequate cooking space around a set of circular dining furniture the client wanted to include. With two runs of less than 3m length each, we had to balance the inclusion of equipment, with the practical use of the Outdoor Kitchen. As such we recommended an Aurora 540 with Rotisserie and Backburner – giving a plentiful cooking surface of 76 x 46cm. Accompanying this we proposed a Single Side Burner and Blastcool Outdoor Fridge. There was not space to accommodate a ceramic grill, but we were able to design a Table Top Wood Fired Oven into the kitchen. This could be used for pizzas and for slow cooking via its refractory floor. 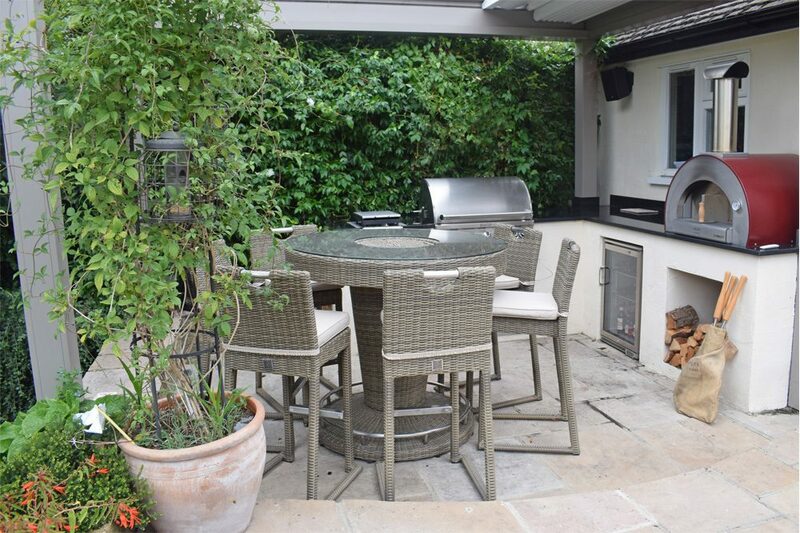 The client was aiming to add to the Mediterranean feel of his terrace, so the outdoor kitchen was finished with a textured cream painted render alongside granite work surfaces. A slated vertical board is to be positioned in between the BBQ and the hedge. With the initial contact in January, we were able to ensure the build was able to be completed at the beginning of April. Brickwork construction began in March, alongside templating of Granite and ensuring all the equipment was ready for installation. Working within a small area and with a canopy being installed overhead, the outdoor kitchen required a precision build, with consideration of the thickness of the render to be added on top of the brickwork. Small side access on the opposing side of the garden meant every brick and product had to be hand carried around the terrace. 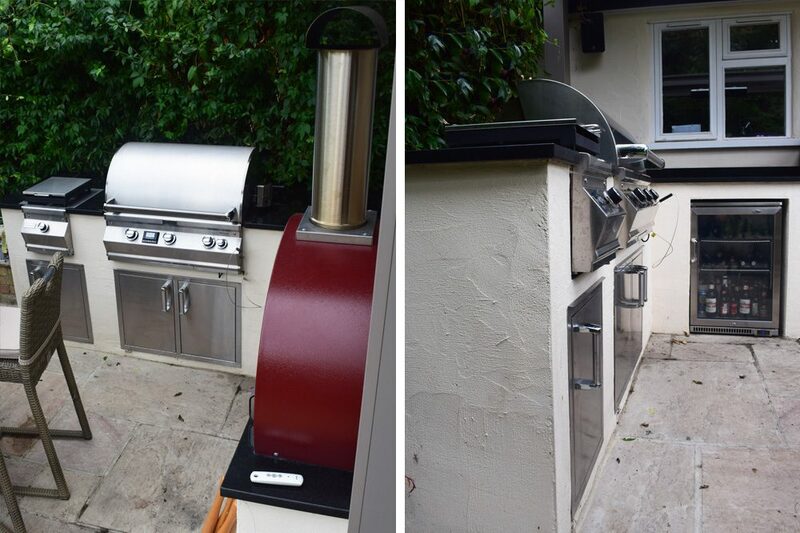 With the outdoor kitchen brickwork complete, an experienced plasterer provided the textured render and our granite specialist attended the site before our installation team installed Fridge, BBQ and Pizza Oven. 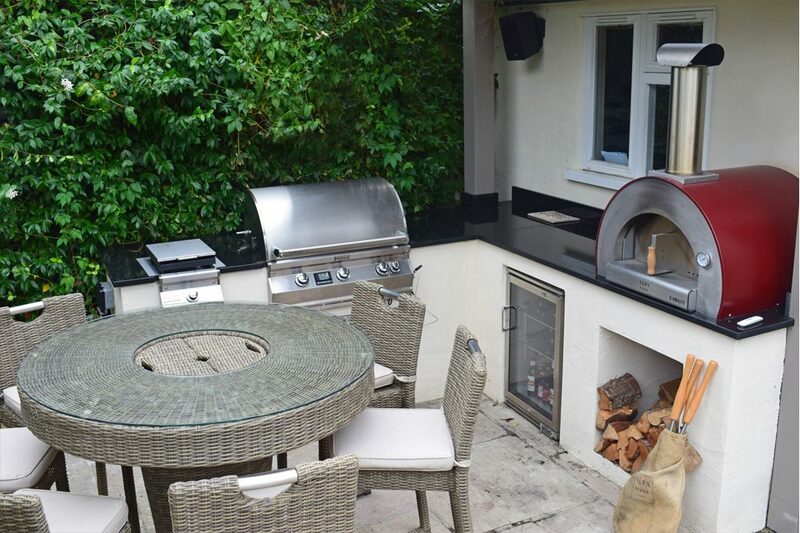 Each contractor’s workload needed to be balanced with the planned schedule, and we were able to complete the project to the clients preferred timescale, allowing him full use of his new outdoor kitchen from the start of spring.